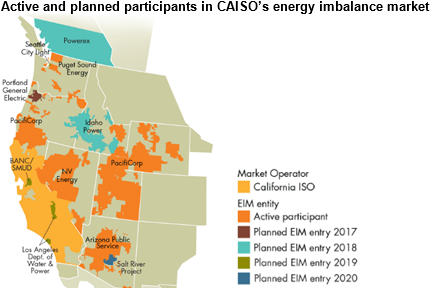 Seven electricity providers in the western portions of the United States and Canada have plans to join the California Independent System Operator’s (CAISO) western energy imbalance market (EIM) over the next several years. The EIM allows for more frequent dispatch of electricity-generating resources in the region. As the EIM’s membership grows, adding more generating resources spread over a wider geographic area can provide additional opportunities for matching electricity supply and demand more efficiently. 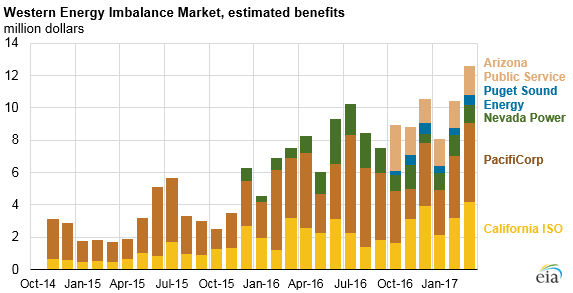 Through the EIM, CAISO trades electricity in a sub-hourly market with neighboring electric grid operators, known as balancing authorities. The market is unique in the West, where most generation is otherwise dispatched hourly. The EIM awards bids for 15-minute intervals and dispatches generating units every 5 minutes to correct supply and demand mismatches without using the generators held in reserve. This sub-hourly dispatch increases responsiveness to changes in the electric system, allowing for better integration of wind and solar resources that can have frequent changes in generation. 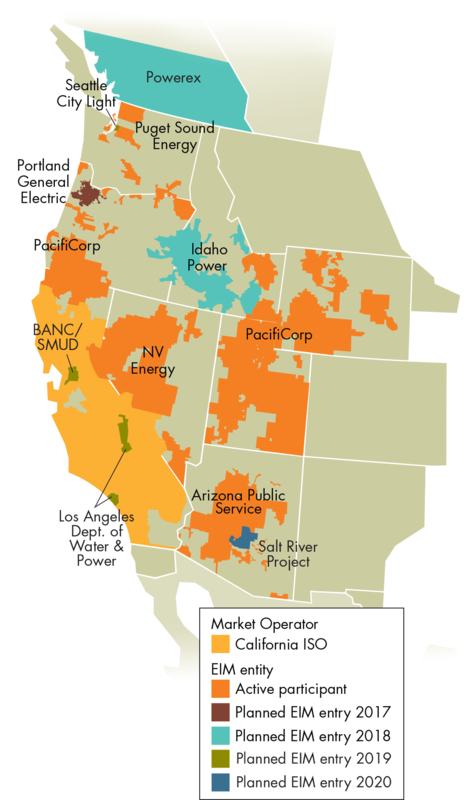 CAISO began the western EIM in the fall of 2014 with PacifiCorp as the initial cooperating entity. Since then, three more balancing authority areas—NV Energy, Arizona Public Service, and Puget Sound Energy—have joined. The EIM currently balances systems that supply 55% of electricity sales in the western grid of the Lower 48 United States. Six more U.S. balancing authority areas have announced plans to participate through 2020, expanding the system to cover another 16% of electricity sales in the western United States. In addition, Powerex, a subsidiary of the Canadian balancing authority BC Hydro, announced plans to join the EIM in 2018 and will be the first non-U.S. entity to participate. Sub-hourly electricity trades across balancing authorities can lower generation costs. CAISO calculates cost savings by comparing the cost of generation that was dispatched with the estimated cost of what would have been dispatched in the absence of the EIM. Benefits come in two forms: cost savings if an area imports electricity that would have been more expensive to generate locally and revenues from real-time exports that would otherwise not have been scheduled. Since late 2014, CAISO estimates the gross financial benefit for EIM members is about $174 million. Cost savings have grown as increased membership has added supply resources, demand, and transmission to the market. By increasing market options and real-time responsiveness, the EIM also improves the integration of renewable resources, which may be curtailed if there is not a way to store or export unscheduled excess generation. Absent the EIM, CAISO estimates that more renewable generation would have been curtailed during periods of oversupply.